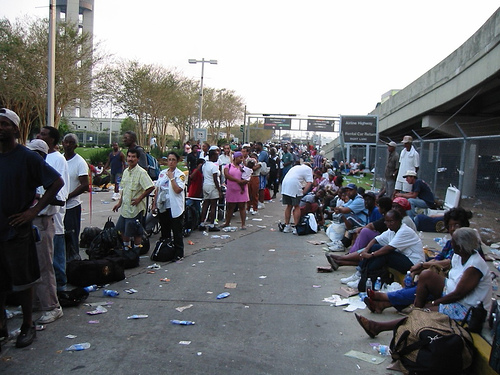 New Orleans residents wait at the airport for evacuation after Hurricane Katrina. When Katrina struck the city, the effects were highly uneven, with black, poor, female, and older residents bearing particularly high costs. In early 2010, two major earthquakes shook the Americas. The first, clocking in at 7.0 on the Moment Magnitude Scale (the successor to the Richter Scale), hit just outside Port-au-Prince, Haiti. It killed 230,000 people (BBC 2010). The country is still reeling from the earthquake devastation despite a massive outpouring of international aid. The second earthquake, which struck south of Santiago, Chile, was 500 times stronger -- 8.8 on the Moment Magnitude Scale. Yet it killed only 521 people (AFP 2010). Chile was able to mobilize an effective disaster response, and the country quickly got back on its feet. In this equation, risk refers to the threat to humans and the things we value from some sort of event. Hazard refers to the characteristics of the natural event itself -- for example, the location and magnitude of an earthquake and the stability of the region's geology. Though the concepts here were originally developed with reference to "natural hazards" like floods and hurricanes, they can easily be extended to human-caused or technological hazards such as anthropogenic climate change, nuclear meltdowns, or GMOs. In the case of human-caused hazards, the hazard refers to the characteristics of the originating system, such as the nuclear industry. Vulnerability in the risk equation refers to the susceptibility of a human society to damage, given a certain hazard event (Turner et al. 2003). Because vulnerability can vary so widely between societies, or between social groups within a society, geographers sometimes remark that "there's no such thing as a natural disaster" (Smith 2006). What we mean by that is not that nature plays no role in the events commonly called "natural disasters," or that the natural elements are somehow caused by human activity (though as noted above, they may be). What we mean is that how societies are organized is a major determinant of how much harm a disaster will do. We can blame the earthquake for the plight of the Haitian people -- but we can also blame poverty, colonialism, and government corruption. Figure 1: Social Index of Vulnerability, 2000 The SoVI is an attempt to compile the socially-produced factors that influence vulnerability to a wide range of natural and technological hazards. 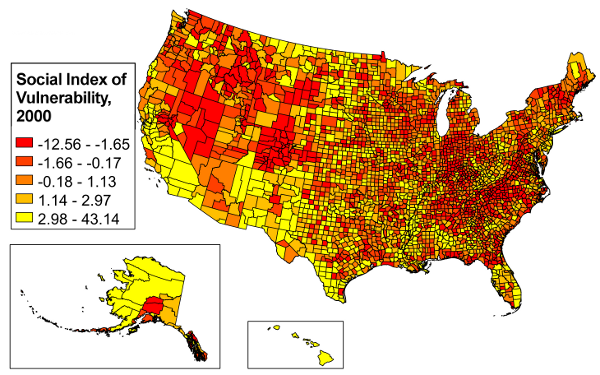 (Higher numbers -- yellow on the map -- indicate greater vulnerability.) The SoVI combines 42 variables, including such things as income, number of children and elderly residents, and quality of housing. Exposure: Exposure refers to whether the hazard event intersects with the human systems in question. A given society or social group may be especially vulnerable to a hazard because they are forced into harm's way. Thus, for example, the poor are often more vulnerable to floods because they can only afford houses close to the river, whereas the rich can live on the hills. Or a group may voluntarily move into harm's way because they're seeking out other benefits, as when rich southern Californians buy homes in beautiful but fire-prone exurbs. Resistance: Once a hazard hits, how much hurt does it do? Certain human systems can resist the damage from a hazard more easily than others. For example, if you have a tile roof on your house, but your neighbor has wooden shingles, your neighbor will be more vulnerable in the event of a forest fire, because wood doesn’t resist the fire’s heat. Or if you planted a drought-tolerant strain of sorghum, your crops will be more resistant to a drought than those of a neighbor who planted a variety of maize that requires a lot of water. Adaptive Capacity: Adaptive capacity refers to a person or group's ability to deal with, and bounce back from, adversity. Insurance policies or substantial savings may be one important source of adaptive capacity, allowing victims of a hazard to rebuild their lives. Someone who lacks such sources of money would be less able to adapt to the hazard, and thus more vulnerable to it. Vulnerability commonly correlates with the major axes of inequality in a society. In various ways, poor people, people of color, women, and people with disabilities, among others, are usually more likely to suffer harms from hazard events. Indeed, differences in vulnerability are a significant way that axes of inequality can be reinforced and maintained. Being forced to frequently deal with bad risks can prevent a group from achieving equality. Vulnerability can be highly differentiated spatially, as the causes of vulnerability differ systematically from place to place (Cutter et al. 2000). At the broadest scale, you can't be exposed to a hurricane in Oklahoma, for example. Aspects of vulnerability that derive from various other axes of inequality will vary spatially along with those axes of inequality. So, for example, if people of color are more vulnerable to a hazard (e.g. because a history of racism has limited the reach of their social networks, thus reducing their adaptive capacity), then vulnerability will be higher in neighborhoods with high concentrations of people of color (which can in turn be explained by the factors we discussed in our section on racial residential segregation). The causality may run the other way as well. One of the harms inflicted on people on the disadvantaged end of an axis of inequality may be confinement to more vulnerable places. For example, poor people in Guatemala City can only afford to live on the steep hillsides around the city, which are highly susceptible to landslides in the event of an earthquake (Wisner et al. 2004). Nevertheless, not all vulnerability is expressed spatially. Social differences within a given place can make some people more vulnerable even than members of their own immediate household. For example, a person with a mobility impairment may have much less resistance than someone without such an impairment with respect to a forest fire, because they cannot easily move around the house to put out small ember fires after the main fire front has passed. 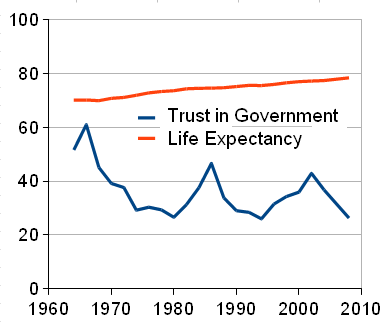 Figure 2: Life expectancy and trust in government in the US. Life expectancy is given in average expected years of life for a baby born that year. Trust in government is the average pro-government survey response to the questions "How much of the time do you think you can trust the government to do what is right?" "Would you say the government is pretty much run by a few big interests looking out for themselves or that it is run for the benefit of all the people?" "Do you think that people in the government waste a lot of money we pay in taxes, waste some of it, or don't waste very much of it?" and "Do you think that quite a few of the people running the government are crooked, not very many are, or do you think hardly any of them are crooked?" Sociologist Ulrich Beck has proposed that people in the modern industrialized world live in a "risk society" (Beck 1992). This phrase is often misused to mean that there are now a lot more risks in our society. From listening to the media, one could easily get that impression -- we hear constantly about new threats from cell phone radiation, or bovine spongiform encephalopathy ("mad cow disease"), and many others. But in fact statistics show that people today are living longer, healthier lives than ever before (Wildavsky 1988). Beck's actual point was that the distribution of risks has become an important source of conflict in our society. In the past, the main conflict was over the distribution of socially-produced goods (wealth, food, etc), for example in struggles between workers and employers. But in today's risk society, an increasing source of conflict is over who should have to bear the risks that occur, particularly risks like toxic waste and nuclear meltdowns that are produced by society. But if risks are objectively decreasing, why would society become more concerned with them? An important part of the story is the role of trust. In this context, trust can be defined as reliance on the actions of another in a context of uncertainty. Studies have shown that trust in the people responsible for managing a risk strongly shapes how concerned people are about that risk (e.g. trust in nuclear power companies determines concern about the risk of a nuclear meltdown) (Cvetkovich and Löfstedt 1999). Rather than trying to weigh the likelihood and harm of various outcomes, people weigh whether they trust the people in charge. What's distinctive about modern society is how much we are forced to rely on hopefully-trustworthy others. The complexity of modern society means that each person is highly dependent on the actions of others to prevent risks. Moreover, many of the risks we face today, such as chemical contamination, can't be detected by individuals acting alone -- we have to rely on experts to give us accurate information (Freudenberg 2001). Thus, the possibility for a betrayal of trust becomes highly important. It is notable that in the developed world trust in all major social institutions, including the government, has fallen since the middle of the 20th century (Figure 2). Much research has been dedicated to investigating the reasons why people would trust or distrust certain people or institutions to manage risks, and why people would trust or distrust information about risks that they receive from certain people or institutions. There are two basic approaches to understanding trust: cognitive and cultural. These are not necessarily competing explanations -- both types of factors may be at work in shaping whether a person trusts another. The cognitive approach is based on the idea that people decide whether to trust a person or institution (the "trust object") by weighing a combination of factors about the trust object. Researchers differ on the specific list of factors that are involved, but one representative paper lists them as commitment, competence, caring, predictability and openness (Kasperson et al. 1992). That is, to be trusted, a trust object should show that they're committed to doing what they're being trusted to do, that they have the competence to actually do it well, that they care about the truster's well-being, that their handling of the situation is predictable, and that they are open about what they're doing and why rather than hiding information from the truster. The cultural approach is based on the idea that people trust trust objects that are culturally similar to them and share similar values (Earle and Cvetkovich 1995). Thus, a person with a strongly hierarchical disposition, who values maintaining order and respecting expertise, would be likely to trust a bureaucratic institution like the Environmental Protection Agency. On the other hand, someone with a more egalitarian disposition would be more likely to trust an environmental activist group like Greenpeace. Most research on the cultural approach to trust has incorporated Grid-Group Cultural Theory as a guide to the different cultural orientations that people may take. Traditionally, attempts to prevent risks have focused on the hazard event itself. Engineers worked to stop natural events through strategies ranging from high levees to block floodwaters, to intensive fire suppression policies to stop forest fires, to backup circuits and automatic cut-offs in nuclear plants. Figure 3: A hazard-focused approach (top) and a vulnerability-focused approach (bottom) to wildfire risk reduction. In recent decades, wildfire management in the United States has shifted from focusing purely on reducing the hazard through fire suppresison, to also emphasizing the reduction of homeowners' vulnerability through programs encouraging people to clear brush around their homes and clean out their gutters. One problem with this hazard-focused approach is that it requires a significant amount of hubris to imagine that human efforts can fully control hazard events. This point may be fairly intuitive when it comes to natural hazards. But it applies even to human-caused or technological hazards. Complex technological systems are subject to what are called "normal accidents" (Perrow 1984). A normal accident is normal because it is an inevitable failure of any complex system. A nuclear power plant, for example, is a conglomeration of a huge number of sub-systems. The installation of backups and failsafe mechanisms only make the system more complicated. But the more complex the system, the less it is possible for a formal risk analysis to calculate all of the combinations of events that could cause a system breakdown. Moreover, a hazard-focused approach often backfires. The many levees built around the United States by the US Army Corps of Engineers lulled the public into a false sense of security. Dense housing developments sprung up on the now-safe land just behind the levees. But eventually, the levee would fail if there was a storm big enough or the levee maintenance was not kept up. The resulting floods were even more damaging than ordinary floods would have been, because a much larger population was now exposed to the hazard (Burton et al. 1978). In the case of fire suppression, putting out small fires led to a buildup of fuel, so that the forest was primed for a huge, more destructive (to people and the ecosystem) fire (Pyne 2004). Thus, an important trend in contemporary policy regarding risks is to focus on reducing vulnerability. Vulnerability reduction strategies are extremely diverse. In the field of forest fires, for example, laws have been passed by states and municipalities restricting development in dangerous areas, mandating fire-safe house construction and yard maintenance (e.g. cutting down trees growing close to the house), and subsidizing fire insurance (Figure 3). Narrowly-focused vulnerability reduction policies may only be a Band-Aid on the problem. In many cases, what is really necessary to reduce vulnerability is to address the underlying inequality with respect to race, gender, etc. If, for example, women are more vulnerable to hurricanes because they have more responsibility for taking care of children and the elderly and thus can't evacuate quickly (Seager 2006), the only real solution is to change the social structure that puts a disproportionate amount of caretaking responsibility on women. This can be an extremely difficult project, but its potential payoff spans all of the different hazards that people may be subject to. This is not to say that management of the hazard event should play no role. In many cases, the causes of vulnerability are so deep-rooted that it is unlikely that they can be addressed in the short term (during which time more hazard events will strike). And the costs of trying to reduce vulnerability may be much greater than the costs of preventing the hazard event. This debate has been particularly intense in the field of climate change, where the terms "mitigation" and "adaptation" are typically used for what we have been calling management of the hazard event and reduction of vulnerability. Most climate scientists hold that mitigation is usually the more cost-effective strategy (though it is becoming clear that some degree of climate change is inevitable and thus must be adapted to) (Metz et al. 2007), but some thinkers disagree (Lomborg 2001). Agence France-Presse. 2010. Chile raises official toll from February quake to 521. Beck, Ulrich. 1992. Risk Society: Towards a New Modernity. Newbury Park, CA: Sage. British Broadcasting Corporation. 2010. Special Reports: Haiti Earthquake. Burton, Ian, Robert W. Kates, and Gilbert F. White. 1978. The Environment as Hazard. New York: Oxford University Press. Cutter, Susan, J. T. Mitchell, and M. S. Scott. 2000. Revealing the vulnerability of people and places: A case study of Georgetown County, South Carolina. Annals of the Association of American Geographers 90: 713-737. Cvetkovich, George T., and Ragnar Löfstedt. 1999. Social Trust and the Management of Risk. London: Earthscan. Earle, Timothy C., and George T. Cvetkovich 1995. Social Trust: Toward a Cosmopolitan Society. Westport, CT: Praeger. Freudenberg, William R. 2001. Risk, responsibility, and recreancy. Research in Social Problems and Public Policy 9: 87-108. Kasperson, Roger E., Dominic Golding, and Seth P. Tuler. 1992. Social distrust as a factor in siting hazardous facilities and communicating risks. Journal of Social Issues 68: 161-187. Lomborg, Bjørn 2001. The Skeptical Environmentalist: Measuring the Real State of the World. Cambridge: Cambridge University Press. Metz, B., O.R. Davidson, P.R. Bosch, R. Dave, L.A. Meyer, eds. 2007. Contribution of Working Group III to the Fourth Assessment Report of the Intergovernmental Panel on Climate Change. New York: Cambridge University Press. Perrow, Charles. 1984. Normal Accidents: Living With High-Risk Technologies. New York: Basic Books. Pyne, Stephen J. 2004. Tending Fire: Coping With America's Wildland Fires. Washington DC: Island Press. Seager, Joni. 2006. Noticing gender (or not) in disasters. Geoforum 37: 2-3. Smith, Neil. 2006. There's no such thing as a natural disaster. Understanding Katrina: Perspectives from the Social Sciences. Social Science Research Council. Turner, B. L., Roger E. Kasperson, Pamela A. Matson, James McCarthy, Robert W. Corell, Lindsey Christensen, Noelle Eckley, et al. 2003. A framework for vulnerability analysis in sustainability science. Proceedings of the National Academy of Sciences 100 (14): 8074-8079. Wildavsky, Aaron. 1988. Searching for Safety. New Brunswick: Transaction Publishers. Wisner, Ben, Piers Blaikie, Terry Cannon, and Ian Davis. 2004. At Risk: Natural Hazards, People's Vulnerability, and Disasters. New York: Routledge. Yohe, Gary, Elizabeth Malone, Antoinette Brenkert, Michael Schlesinger, Henk Meij, and Xiaoshi Xing. 2006. Global distributions of vulnerability to climate change. Integrated Assessment Journal 6 (3): 35-44.